This vase is approximately 255mm (10 inches) tall. It has random bubbles of various sizes in the base. The stem has a wide flare approximately 40mm (1 & 9/16ths inches) across the top and wider than most where it meets the base. 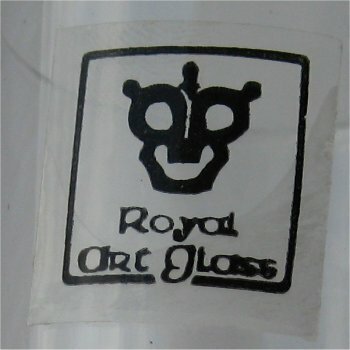 The label is clear plastic, square shaped with black writing stating "Royal Art Glass" (see image below). 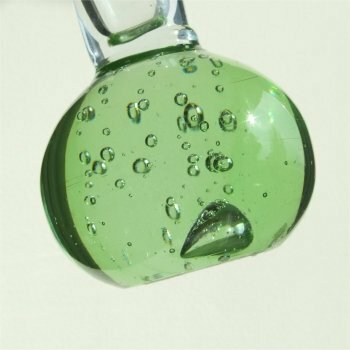 The colour of the base is a soft lime green with a clear stem. 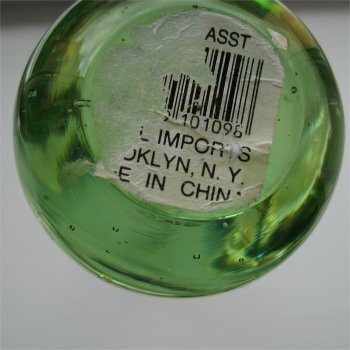 On the bottom of the base is a bar code label, which states it was made in China and was imported by an import company in Brooklyn? New York. Unfortunately it is not possible to see how the bottom is finished because of the label.